Colonel Bernard Fisher, awarded the Medal of Honor in 1967, died over the weekend in Idaho, KBOI 2News reports. He was 87. 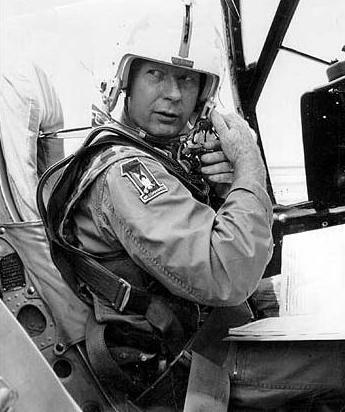 Fisher was first to receive the Air Force designed Medal of Honor, which was established on April 14, 1965 (The first Medal of Honor received by an airman was awarded to Capt. Edward V. Rickenbacker for aerial combat in 1918). President Lyndon B. Johnson presented the award to then-Maj. Fisher for risking his life to save a fellow pilot shot down during action in the A Shau Valley of Vietnam in 1966. Fisher, who volunteered to go to Vietnam, “landed his Douglas A-1E Skyraider on an airfield controlled by the enemy under the most intense ground fire, pulled the downed pilot aboard his aircraft, and successfully escaped despite several bullets striking the plane,” according to his Air Force factsheet. Today, the aircraft is on display at the USAF Museum at Wright-Patterson Air Force Base, Ohio. Fisher commissioned into the Air Force in 1951 after serving in the Air National Guard for three years. He served briefly in the Navy at the end of World War II prior to becoming an airman. Fisher had extensive experience, the factsheet says, in fighters such as the F-80, F-86, and F-101, along with hundreds of close air support missions in the A-1E. Born in San Bernadino, California, Fisher was raised and educated in Utah before he retired as a colonel to his hometown of Kuna, Idaho. Read Col. Fisher’s full Medal of Honor citation here. I remember the heroic save by Maj Fisher as if were yesterday. That was a breath taking landing and takeoff and will make any pilot break out in a cold sweat to witness it. Definitely above and beyond!!!!!!!!!!!! !